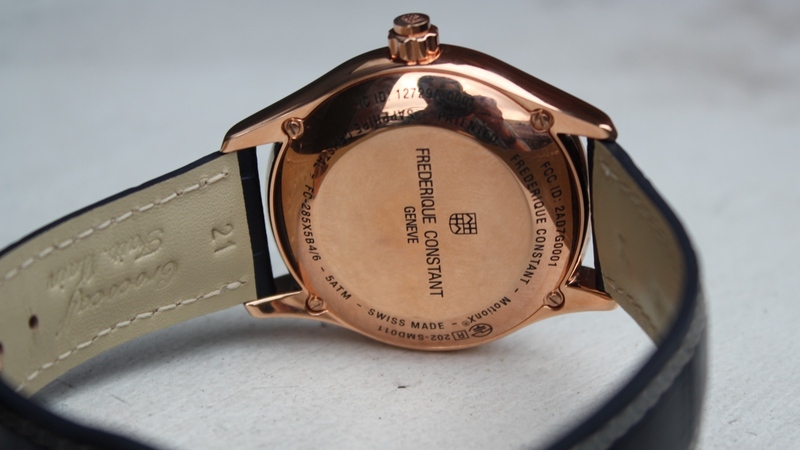 The first batch of Frederique Constant Horological Smartwatches went live at Baselworld 2015 and, apparently, have been an unmitigated success for the company. Its CEO Peter Stas told Wareable that the smartwatch alone had helped the company grow in 2015, bucking the market trend. At this year's Baselworld the Swiss watchmaker took the covers off of its 2016 model - the Worldtimer edition. The latest addition to the smart analogue watch family brings a more luxurious look, a waterproof design, and features a new second time zone mode among other software tweaks. If you want one, you're going to need to shell out more than £1000 to get it around your wrist. We've slapped the connected timepiece on for the past week to see if the Swiss watchmaker has delivered the goods once again. 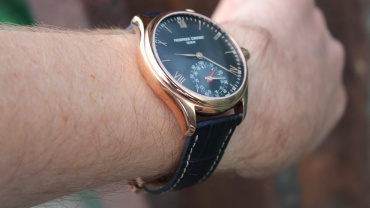 Here's what life was like with the Frederique Constant Horological Worldtimer edition. 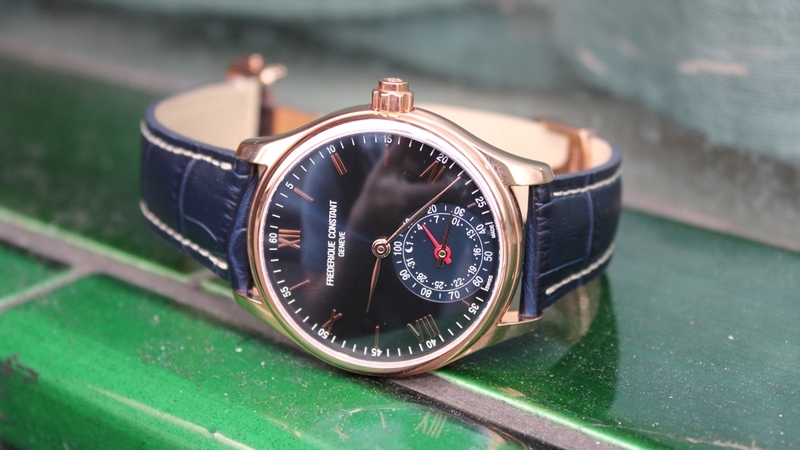 The upgraded Horological Smartwatch boasts a 42mm rose gold plated polished stainless steel case, a navy blue dial with gold indexes and hand polished gold hands. Although it's water resistent to 5ATM you won't want to be getting it too wet as it also boasts a swanky blue alligator leather strap. Watches are so, so subjective so while I think this model is superb looking - other people might label it a garish mess. However, what you cannot disagree with is the build quality. From the convex sapphire crystal covering the face to the rose gold screws on the back, everything just screams "luxury". It's also super comfy and a fair bit slimmer and lighter than its Mondaine rival. 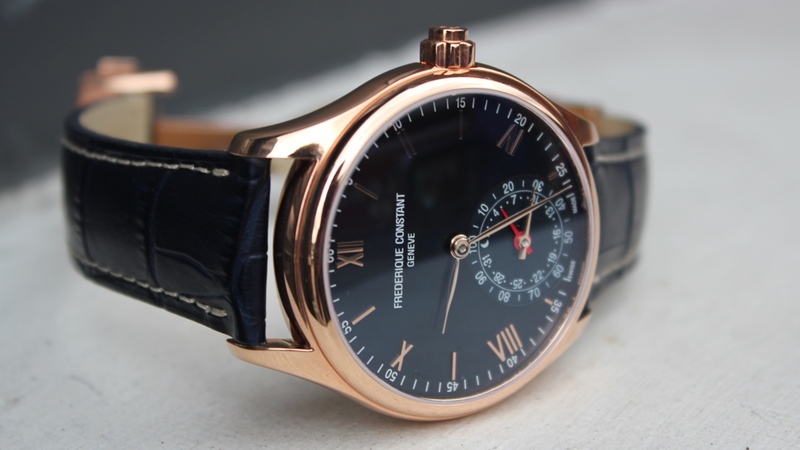 Frederique Constant's Worldtimer edition lets you set a second time zone in the partner app (more on that later). Once set, an alternative time can be summoned by pressing the crown three times, which will send the hands spinning momentarily to your desired time zone. Also (and we couldn't test this for obvious reasons) the home and current zones will automatically switch as you galavant across lines of latitude. Following the lead set by Withings and Mondaine, the bottom of the watch face features secondary dial to present an at-a-glance look at your progress against your daily goal (steps or sleep, you choose). The little red hand points to the current day of the month, while the second larger rose gold hand rotates to show your goal percentage completion. In terms of activity tracking, the usual mix is on offer from the Horological: steps, calories and distances. As we always say in our fitness tracker reviews however, there's an element of trust that goes with any algorithmic metric calculation. There's no GPS on board so you're relying on the accelerometer and other sensors packed in to estimate your total. 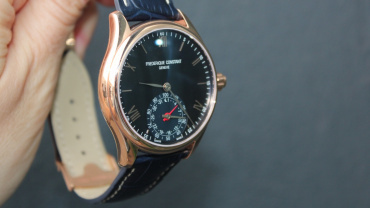 However, Frederique Constant hasn't flown solo on this front; the fitness smarts are taken care of by MotionX – a platform from Silicon Valley based company Fullpower. MotionX tech has also powered Jawbone and Nike wearables in the past, so it's a brand with plenty of heritage in this area. I found the step counting to be pretty much inline with what I was seeing while wearing a Garmin Vivosmart HR at the same time; it was no more than 5% out over a few days, with step counts between 10,000 and 15,000. Sleep tracking, however, I found to be pretty sloppy. Sure, it gave me my stats on deep and light sleep, and the amount of time I was awake (although I've no real way of knowing these stats were accurate). However, you have to manually enter sleep mode, either by pushing the dial on the watch or by selecting the mode in the app. And we found that some days, 'sleep' was tracked when we were just sitting still - even though it's not supposed to have an auto detect sleep function. Weird indeed. Unlike the Fossil Q Grant, there are no smartwatch notifications with the Frederique Constant. As we lamented with the Mondaine Helvetica No 1 Smart it would be nice for the watch to buzz when a text or incoming call came in, for example. The Manufacture Modules Technologies (MMT) collaboration was announced in early 2015. 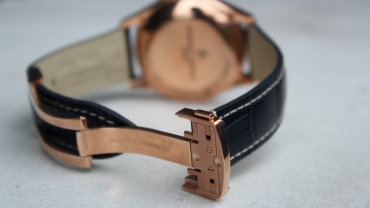 It's a tie-up between Fullpower Technologies (the guys behind the MotionX tech) and Swiss company Union Horlogère (owners of both Frederique Constant and Alpina). Third parties can also license the quartz module tech as well. As such, the app is a universal one for the platform, rather than one designed for the individual devices. It's pretty basic to say the least - don't expect what you'd see from the likes of Jawbone or Fitbit, although you do get a decent overview of your activities and sleep, broken down by day, week or month - along with a 'dynamic coach', which offers averages and 'helpful' tips. When it comes to battery life, you'll get more than two years before you have to get the cell changed. We obviously couldn't test that fully though. It's a lovely looking watch (I think, at least) and the step counting is pretty accurate. However, the sleep monitoring was a bit of a horror show. We'd also have expected the Horological Smartwatch Open Platform (and its Motion X app) to have progressed a bit by now - it's all a bit basic on the app front. There's no smart notification alerts either. However, if you're looking for a slick looking watch / glorified pedometer then the Worldtimer could be for you. Sure, it's expensive - but since when has that stopped people buying stylish timepieces? The Frederique Constant Horological Smartwatch is on sale in the UK from £1,120 from WatchShop.com, who kindly loaned us a sample for this review.